Willard Nesbitt is dead and he wants to keep it that way. He supposedly drowned in a boating accident. But it�s almost a moot point�his doctors had told him he only had a short time to live anyway. He wants his delicious young wife Eve to collect on his double-indemnity life insurance policy. But when his crooked business partner illegally cuts Eve out of a $500,000 gold deal, Nesbitt must rise from the dead to warn her. Then someone kills him for good. Eve is naturally a suspect as the police smell insurance fraud. It�s up to Perry to set them straight. Goof: Lloyd Castle, on the stand, refers to Jenny Bartlett as Miss Barton. Later, on the stand, Perry correctly calls her Bartlett. Location: This is another episode shot around Malibou Lake. There are two scenes that show the Clubhouse building. The main differences are the Haven Motel sign and the Coke machine. Submitted by Eric Cooper, 2/12/08, via email. Posted by daveb. A picture of the building and some screen shots can be found here. Read more at The Lakes. Location: The Nesbitt cabin on the lake should seem familiar to Perry and Della. Perry stayed there in the TCOT Angry Mourner. It was also used again in TCOT Watery Witness. Altogether, we get a pretty good sense of the property. I'm guessing since it was reused so many times, it may have had some connection to the studio/cast/crew. Submitted by billp, 6/9/2011. Karl Held makes his first appearance on Perry playing Bruce Nesbitt. He will make 9 more appearances in season 5 playing David Gideon, Perry�s (and Paul�s) assistant each time. Submitted by PaulDrake33, 3/6/2009; updated by gracenote, 7/6/2011. + Minor correction: in Karl Held's next Perry appearance, episode 122 The Case Of The Grumbling Grandfather, he does indeed play David Gideon, grandson of the episode's titular character; however, he does not appear as Perry's assistant until episode 126 The Case of the Missing Melody. jfh 02Jan2018. Sightings: Blue Collar Guy is briefly visible (through the glare on the windshield) as the truck driver who picks up Willard Nesbitt in front of the motel. More about him and other frequently-seen people here. Submitted by alan_sings, 9/26/10. + During the hearing, the Little Old Lady in a Hat, Distinguished Lady #3, and �Miss Carmody� sit in the gallery (prosecutor�s side) during the hearing. Distinguished Gentleman #1 appears on the defendant�s side, and at some point �Miss Carmody� teleported there, because we see her leaving on the defendant�s side. Submitted by gracep 11/6/2010. +The Distinguished Lady #4 joins the courtroom scene in the back row. Bill767, 1/3/16. Costume Goof: At 1:48, Willard Nesbit returns to his cabin after swimming ashore and collapsing into the mud; but his shirt seems remarkably clean and dry. The smudges on his cheeks and forehead do not correspond to the severity of his ordeal. Submitted by 10yearoldfan, 20 October 2012. Continuity Goof: At 6:30, we see Eve and Bruce Nesbitt leaving their cottage, each carrying a suitcase. But when the scene shifts to the driveway, Bruce doesn't seem to have his suitcase any more. We certainly don't hear him put it into the back of the car or close the back window before he gets in and they drive off. Submitted by 10yearoldfan, 20 October 2012. + Bruce is still holding the suitcase in his left hand; you can see his left arm held straight down (due to the weight of his suitcase) and you can see a brief flash of the suitcase as Eve is placing her suitcase in the car and then another flash of the light-colored sweater he is holding above the suitcase in his left hand. The director may have told the actor not to make any additional noise by placing the suitcase in the car or closing the door since he knew the back of the car would not be seen when the car drives off. Submitted by Wiseguy70005, 8/06/14. CARS. 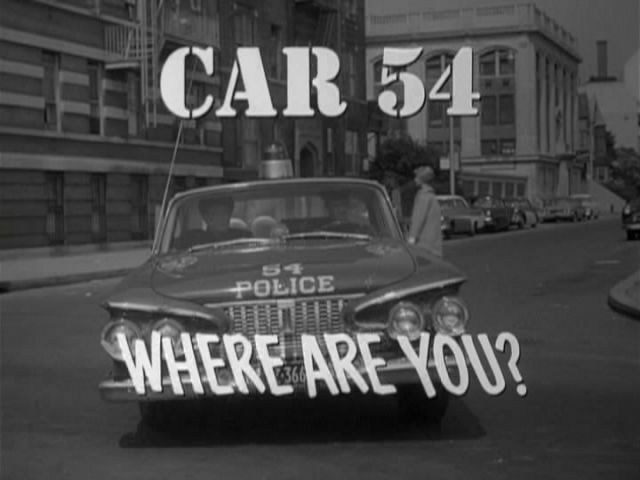 (1) 1961 Plymouth Savoy 4-Door Sedan, POLICE B&W, Lic No " E 606". Appears with Second Deputy early & half-way thru show. Same make/model/yr was in ep#s106 & 107. 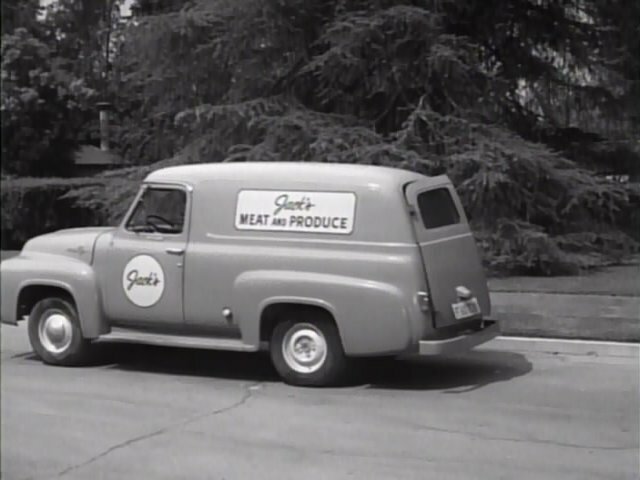 (2) Eve's 1955 Chevrolet Nomad wagon, white/med (same as Car (4) in ep#101). (3) 1939 - 1949 White WA-Series Truck, Lic No W91 767, with White SUPER POWER engine, possibly Truck Model WA-20, driver ID'd in "Sightings", above. (4) Perry drives his black 1960 Ford Galaxie Special Sunliner, Lic No TVC 236, to Anderson's Motel, top down. (5) 1956 Ford Customline 2-Door Sedan, drab paint, parked at Anderson's motel. It's probably Anderson's car. 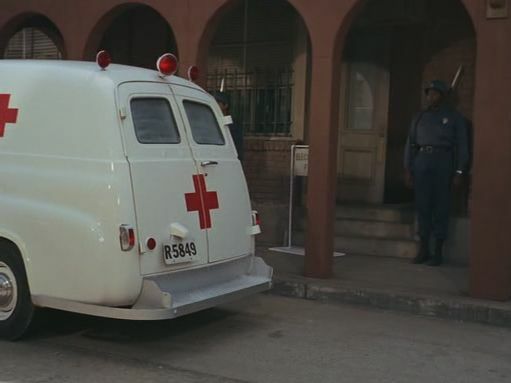 (6) the ambulance (screenshot at top of this page) is probably a 1953-1955 Ford F-100 Panel Amb. Compare lower/rear body shapes. 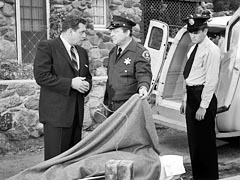 The first character on the Sheriff's licence plate is actually an "E" inscribed in an octagon, signifying a government-owned, fee-exempt vehicle. Added by Gary Woloski, 10/29/12. Confounded Contract: At 7:55 on the DVD we see the supposed contract for dissolution of the partnership. But from the small portion shown, it describes an employment contract for a TV script (as it mentions "photoplay"), more so than a mining enterprise. JohnK, 7 October 2015. + The title of this show �Angry Dead Man� brings to mind a cute joke. This man tells his friend he was just forced to shoot a dog. His friend asks him �Was it a mad dog?� He tells his friend �Well the dog sure wasn't too happy about it.� Submitted by PaulDrake 33. 10 Nov 2009. Eve Nesbitt states that she�s from Georgia, where �it was considered vulgar for a woman to know too much about business matters.� I used to live in Georgia, and believe me, it�s not true. Oh, those Hollywood myths about the South! Submitted by gracep, 11/6/2010. 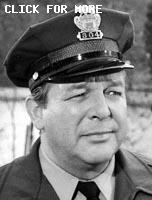 Typecasting: Boomers will recognize Gordon Jones, alias Mike the Cop from The Abbott & Costello Show, as a deputy in this episode. Submitted by francis, 4/11/12. + And he's got the correct L.A. County Sheriff California Grizzly cap-badge on his hat! Gary Woloski, 3/15/17. The scene where Mason challenges Fanny Werbler to describe his necktie may have been the motivation for similar scene in The Simpsons. Hack lawyer Lionel Hutz is questioning Kwik-E-Mart owner Apu Nahasapeemapetilon on the witness stand. He turns away from Apu and challenges him to describe his necktie. Apu describes the necktie perfectly. Flabbergasted, Hutz proceeds to remove his necktie, and then turns to Apu and says, "I'm not wearing a tie at all!" Submitted by 65tosspowertrap, 9/30/2013. Once again (see "The Angry Mourner," show 7) the closed-captioning (on the CBS/Paramount season set) uses the title Ms. during Burger's examination of Ben Otis when referring to Mrs. Nesbitt. Although the term Ms. had existed for some time it started to be frequently used around 1971. I don't believe it would have been used in a 1961 TV episode. Although it sounds like he says Ms., the actor probably just said Mrs. in an unintelligible way (to the closed-captioner) as both he and Mason later definitely say Mrs. Submitted by Wiseguy70005, 8/06/14. First of all, most closed captions are created using speech-to-text software, it usually isn't a person creating them. In the 60s it was an awkward situation when you didn't know if a woman was married or not; or more precisely, whether to call her Miss or Mrs.
Quite a few women were actually insulted if you called them the wrong honorific, especially married women who were called 'Miss'. So in a number of situations, guys would kinda half-swallow the term making it difficult to tell if they said Miss or Mrs. This often sounded a lot like Ms, and the software would write that into the closed captions.